Sakai Guides and DocumentationFaculty Guide Add Participants to a SiteHow do I add participants to my site? Student enrollment for registered courses is handled automatically through integration with DukeHub. However, site owners can add other participants such as TAs, Designers, etc., to their site using Toolkits. 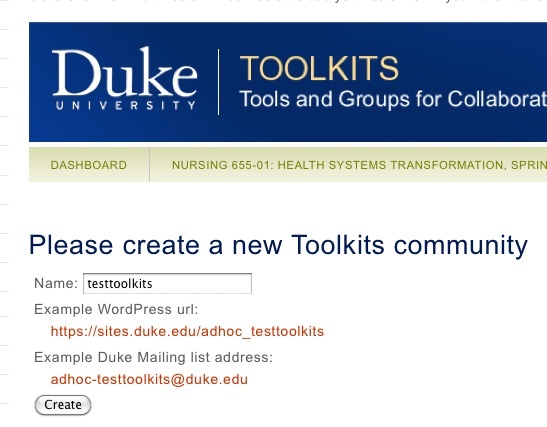 Toolkits allows you to add participants to your course or project site who are not in an official course roster. This includes people with a Duke NetID and visitors. Click Add Participants from Site Info tabs. The process of creating an initial participant list is automated, but it will take a minute for the Toolkit for the course site to load. You will need to first choose a name for the Toolkits community and then hit Create. When the Toolkits creation process is complete, you have two options to add new site participants. To add a participant to your site, search for them by name using either the firstname and lastname, NetID, or email address. When the results come back, choose the button next to the correct participant. Use the drop-down menu to choose the role of the user in your site. TIP: The visitor role is mainly read-only access and is usually the most appropriate when inviting a guest to join your site. The instructor may fine-tune the permission settings in most tools. Once you’ve found the user and chosen a role for them, scroll down and find and click the Add button. If your guest already has a Duke Guest account you will be able to select their name from the search results and simply choose their role in your site. To finish the process, click the Add button below. If your search provides no results, you may invite the guest participant to create an account at Duke. In the email box, type the email of the person you would like to add as a guest and click send. The guest will receive an invitation via email from toolkits@duke.edu with the subject “An Invitation to Create a Duke OneLink Account”. The instructor or site owner also receives a copy of this invitation as a confirmation the invitation has been sent. Once the registration process is complete, guests should contact the site owner with their account details, such as the name and email address they used to create the account. NOTE: It can take up to 1 business day to validate a new guest account created through OneLink. Guests can log in using their Duke Guest account at https://sakai.duke.edu/ using the Visitor Guest Access option at the bottom of the normal log in page to access Sakai. Here are instructions for guests activating an account. If you have a large number of participants to add who will all be assigned the same role, you can use batch add. Type the NetIDs one per line. Select a role and click Add. Once you have added new participants in Toolkits, you should see their names and roles listed on the main screen. Participants who were imported from the course roster (from the official Student Information System, aka SIS) will also appear here and have Sakai role names (like instructor or student) instead of Toolkits role names (like Manager or Auditor). These are equivalent roles and will be displayed correctly in your Sakai participants list. Any applications you add with Toolkits will now include the users you have added. Each member will be given access to different tools with a role that is appropriate for that tool.